If you like organized activities combined with a lot of fun then join us for our special events....we'll be looking for you. Our goal for the River Valley Lodge and Campground is to provide a quality camping experience for you and your horse. For some, that means peace and quiet. For others, that includes organized events and the potential for a large gathering of horsemen, horsewomen, and horses. This Special Events page will highlight an organized event open to anyone who would care to participate. We hope to provide opportunities for everyone to enjoy, either quiet or a busy day of activities. You make the choice. We want Happy Campers and Happy Horses! JUST A REMINDER...if you have already made 2019 reservations in 2018 please confirm these reservations just to be on the safe side. Call Carolyn at 319.878.3888. Just a reminder that you should never assume that the cabins are all taken...give Carolyn a call at 319.878.3888 and find out for sure. Yes, they are usually booked but cancellations do happen so you might well get lucky. April 26th - 28th - Boot Camp Clinic with Sheri Dill-Billings. Kick start your 2019 trail riding. Call 641.919.4021. April 27th - Cornerstone Fellowship Ministry - Cowgirl Conference.Call Greta Cummings at 319.931.1398. May 3rd - 5th - Saddle Up for St. Jude. Includes trail rides, auction, dance, poker run, food, and much more.....and it is all for a good cause! Please bring an item for the silent auction. Special camping rates! May 4th - Kentucky Derby Party - Ladies be sure to wear your best “Derby Hat”. May 17th - 19th - Second of the Ranch Horse Show series. Jackpot sorting, roping, barrel racing, extreme trail course competition, wine tasting, dance, food concessions, and more. May 24th - 26th - Wright’s Donkey Sorting Series. Friday night no charge to just play, Sat. & Sunday competitive sorting. May 30th - June 4th - 12th Annual Cowboy Fun Colt Starting Competition. 1st prize of $2,000 cash. Peoples Choice Award, dance, wine tasting, food, cattle sorting, and more! Colts will be offered for sale after the event. May 30th - June 4th - Horsemanship Clinics with Mark and Miranda Lyons. “Ranch Horse Fundamentals” on May 30th and 31st and “Advancing the Green Horse” on June 3rd & 4th. Call 501.249.0117 for details. June 7th - 9th - Pony Express Riders of Iowa. Includes trail ride, dances, kids fun show, auctions, poker run, food, and more. A Camp Sunnyside benefit. Special rates for primitive campsites. June 14th - 16th - Third of the Ranch Horse Show series. Jackpot sorting, roping, barrel racing, extreme trail course competition, wine tasting, dance, food concessions, and more. 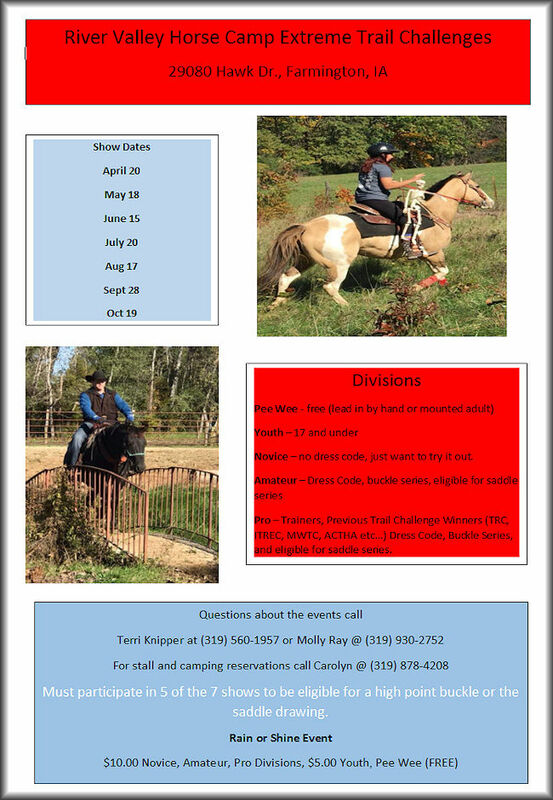 June 15th - Extreme Trail Challenges - Call Terri Knipper at 319.560.1957 or Molly Ray at 319.930.2752. June 21st - 23rd - An instructional retreat called "Let's Paint the Trails". A women's all inclusive trail riding and instructional painting weekend. For details call Sheri Dill-Billings at 641.919.4021. June 21st - 23rd - Wright’s Donkey Sorting Series. Fri. night no charge to just play, Sat. & Sunday competitive sorting. June 28th - 30th - Cowgirl Challenges. July 12th - 14th - All Around Ranch Horse Versatility Championship and All Around Youth Championship. These events have been a great success the last several years. You must register by July 1st to be entered. July 19th - 21st - The fourth of the Ranch Horse Show series. Jackpot sorting, roping, barrel racing, extreme trail course competition, wine tasting, dance, wine tasting, food concessions, and more. July 20th - Extreme Trail Challenges - Call Terri Knipper at 319.560.1957 or Molly Ray at 319.930.2752. July 25th - 30th - The “Old Cowgirls Never Die” presents a great trail ride. For info call Laura at 563.210.3703. Aug. 1st - 4th - Method Downunder Horsemanship Clinic. Limited to 6 people. Call Addie McKee at 641.242.0988. Aug. 9th - 11th - Wright’s Donkey Sorting Series. Friday night no charge to just play, Sat. & Sunday competitive sorting. Aug. 16th - 18th - The fifth of the Ranch Horse Show series. Jackpot sorting, roping, barrel racing, extreme trail course competition, wine tasting, dance, food concessions, and more. Aug. 16th - 18th - Cowgirl Challenges. Aug. 17th - Extreme Trail Challenges - Call Terri Knipper at 319.560.1957 or Molly Ray at 319.930.2752. Sept. 4th - 7th - Tri State Rodeo and Miss Rodeo Iowa Pageant at Ft. Madison. River Valley is a quiet camping location only 25 miles away. Sept. 13th - 15th - An instructional retreat called "Let's Paint the Trails". A women's all inclusive trail riding and instructional painting weekend. For details call Sheri Dill-Billings at 641.919.4021. Sept. 20th - 22nd - Mule Festival at Kahoka, Missouri. Camp at quiet River Valley and take in this great event that is just across the state line. Entertainment Deluxe! Sept. 27th - 29th - Sixth of the Ranch Horse Show series. Jackpot sorting, roping, barrel racing, extreme trail course competition, wine tasting, dance, food concessions, and more. Sept. 28th - Extreme Trail Challenges - Call Terri Knipper at 319.560.1957 or Molly Ray at 319.930.2752. Oct. 3rd - 6th - BFMFRW (Bentler Family Memorial Fall Ride Weekend). Dance, trail ride, wine tasting, food, and more. An annual event you don’t want to miss! Oct. 4th - 6th - Wright’s Donkey Sorting Series. Friday night no charge to just play, Sat. & Sunday competitive sorting. Oct. 5th - Eighth Annual Fall Horse and Tack Consignment Sale. Call Terry at 309.657.1602. For your convenience there will be a riding horse preview. Oct. 10th - 12th - Three Day Fundamental Clinic with Addie McKee, the Method Ambassador for Downunder Horsemanship. Call 641.242.0988. Limited to six people. Oct. 11th - 13th - Check out the Van Buren Scenic Drive Festival for a great time. Oct. 11th - 13th - Cornerstone Fellowship Ministry Cowgirl Retreat - All Girls weekend. Call Greta Cummings at 319.931.1398. Oct. 18th - 20th - The finals of the Ranch Horse Show series. Don’t miss this final competition and awards. Oct. 18th - 20th - Cowgirl Challenges. Oct. 19th - Extreme Trail Challenges - Call Terri Knipper at 319.560.1957 or Molly Ray at 319.930.2752. Oct. 25th - 27th - The Spooky Halloween Weekend....trail ride, dance, wine tasting, contests, and much more fun. Nov. 1st - 3rd - Mounted Shooting Competition. More events and clinics to be announced as dates and details become available so check back at this website often. Copyright © , River Valley Lodge and Campground.